The accolades and accommodations continue to roll in for the 2013 Ford Fusion. The most recent comes from Kelley Blue Book who named the Ford Fusion the Best Redesigned Vehicle for 2013. “More than a handful of vehicles made the short list of finalists for this year, but ultimately the 2013 Ford Fusion was named KBB.com’s 2013 Best Redesigned Vehicle with impressive gains in design, technology and fuel economy,” said Jack R. Nerad, executive editorial director and executive market analyst for Kelley Blue Book. Ford completely redesigned the Fusion for the 2013 model year. The exterior was masterfully remodeled and has since won awards for its sleek, bold styling. Ford added several versatile powertrain options to accommodate every driver’s needs. KBB credited every aspect of the redesign for the 2013 Fusion’s award. 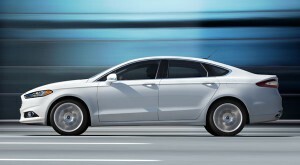 “Outside, the new Fusion is clearly the hottest-looking car in a class with no fewer than 13 other entrants. The interior is just as striking, and a variety of technological enhancements and choice of five powertrains is just icing on the cake. Whatever mix of value, power and fuel efficiency you’re looking for in a mid-size sedan, the new Fusion has it,” said Nerad.